I might sound weird for saying this but I don't wear dangly earrings because I think that they make me look old. Yes I'm an oddball but I also have another reason for avoiding them since a friend of mine tore her earlobe when one of her earrings got caught in a top she was trying on at a store. I was there and let's just say it wasn't pretty and quite painful for her. I've stuck mainly with stud and hoop earrings and they're nice but can get a little boring. And then I branched out to ear crawlers and 360 studs. I'm currently a fan of floating earrings. I like how they combine a classic sensibility and a modern vibe by making the backing that goes behind the lobes a point of visual interest and embellishment. 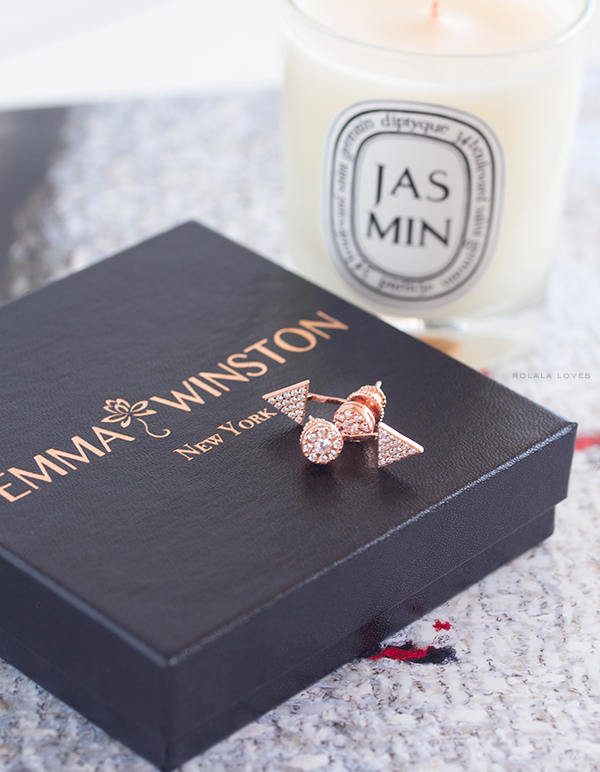 I've pretty much been wearing this pair of Emma Winston rose gold triangle pavé ear jackets non-stop since I received them recently. This chic style can be easily dressed up or down. 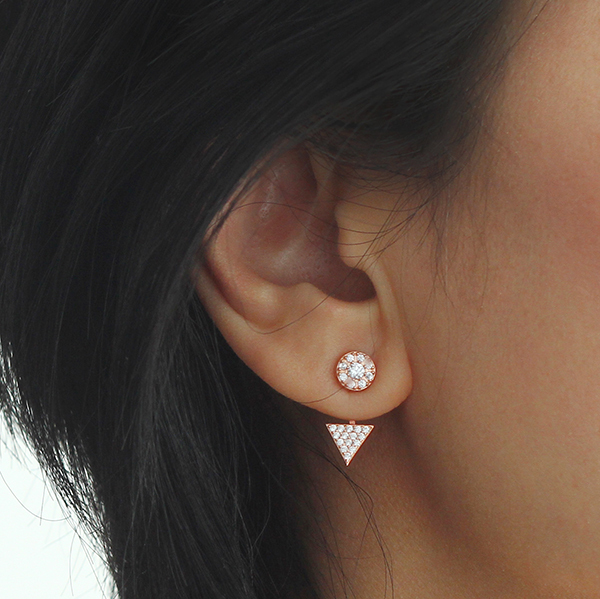 I love the gorgeous rose gold color and how the floating earring style creates the illusion of diamonds floating beneath my earlobes. Emma Winston is a New York-based designer who founded her collection with a commitment to creating high quality designer jewelry at affordable prices. 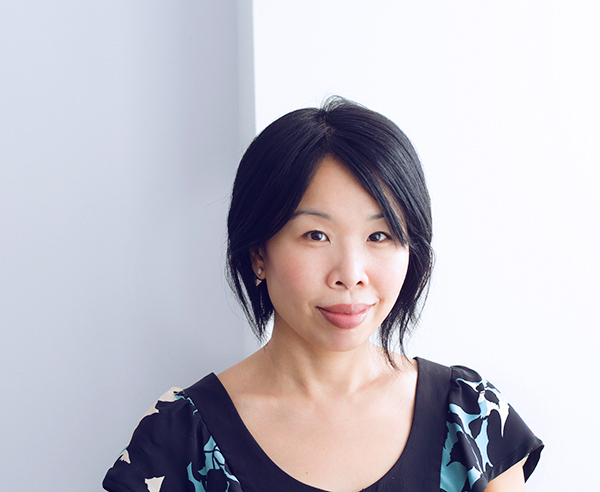 With a passion for ear décor and inspired by the Hudson River, she created a collection of jewelry designed to make an elegant and stylish statement by balancing nature with glamour. The collection is sold exclusively at www.emmawinston.com. Shop now and get 15% off with the code AUDIENCE15OFF. Along with earrings, she offers a range of stylish necklaces and bracelets as well. Emma is also giving everyone a chance to win a pair of her Floating Earrings, Studs or a $25 Gift Card to her shop. There will be 4 winners, You can enter below or through this link! What's your favorite style of earrings? I have never heard of floating earrings before but they sure look great. Ooooh they are so pretty! I assume the raffle is US only? Loving those earring they are stunning. So elegant, I love these earrings and... you look beautiful Rowena! What a really beautiful earrings! Thanks for hosting yet another great giveaway, Rowena. These earrings are so so pretty! I also don't wear earrings, but I'd love to have these! Too bad the giveaway is for US residents only. You look beautiful Rowena! Have a lovely weekend! I don't blame you for wearing this pair a lot, they are gorgeous on you, Rowena! I have been surfing her website and honestly she has such an amazing collection and I'm tempted to purchase a pair! I really like the look of floating earrings, and those are beautiful! Oh I have a thing about dangling earrings too.These are pretty and you wear them so well! I have a thing about dangling earrings too! I thought it was just me. haha. I don't have a particular style that I prefer, I love different kinds of earrings and in the past I created very different earrings, but I must say this pair is really special. Its unique shape and design really catches the eye... diamonds floating...that's the right expression. 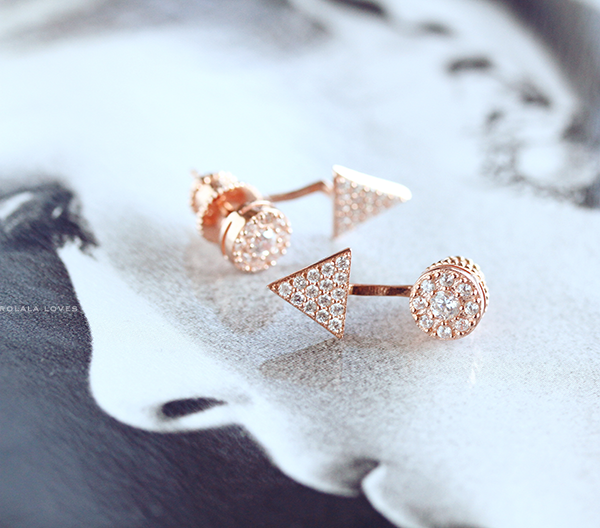 Fabulous earrings but still this pair is subtle and delicate. I think these earrings are a perfect match for your classy and minimalist style. You look so lovely! I guess I know why you can't stop wearing this pair, they look lovely on you! Have a beautiful weekend ahead, my dear Rowena. GORGEOUS you;) ..and LOVE the earrings Rowena!! This style is very flattering. I also like the simplicity of the piece. I can't wear a lot of dangling, heavy jewelry so these would be perfect. You can also dress them up or down and they are perfect for the holidays. These are sooo pretty!! I wish I wore earrings!! They look beautiful, is definitely something I would wear, I am checking their site right now!! Thanks for sharing. They look amazing on you! I don't have a preference,I like most earrings and would wear any if the design is great. These earrings are stunning...love the design! These earrings are so so pretty! I've been loving rose gold lately, and I love how unique and original this design is. Plus, they look really wonderful on you! I love it so so much: elegance and wonderful style!!! Those earrings are sooooo INCREDIBLE!!! LOVE LOVE LOVE! These are very lovely I really think these designs look very elegant and simple I was always careful to not wear heavy earrings as to not tear the lob. Sometimes I wonder those who design them, what they are thinking. Will have to look more into this jewelry line. Thanks for the info as always! !